Strong and imposing - not for the novice dog owner! Akita Inu dogs are strong, independent and dominant. They can be aloof with strangers but affectionate and loving with family members. They are not for the novice dog owner and require strong handling. 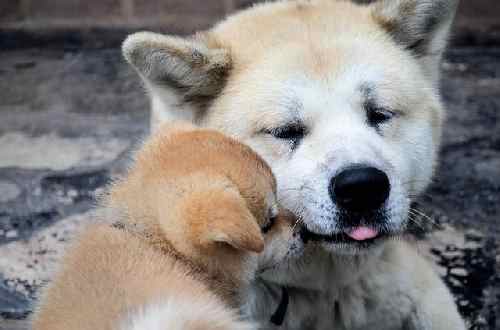 The Akita dog breed can be aggressive towards other dogs yet gentle, compassionate and trusting with their owners. Akita's have a complex personality which can make them difficult to train although they are very intelligent so perseverance and patience should pay off. They are also very clean dogs who seldom bark. However, this doesn't mean they are silent! The Akita dog breed is known for it's grumbling, grunting, moaning and mumbling as a way of it communicating. They love to carry things around in their mouths. Don't be surprised if you find your wrist being gentled encased in your dog's mouth as he leads you to the kitchen when it's dinner time! 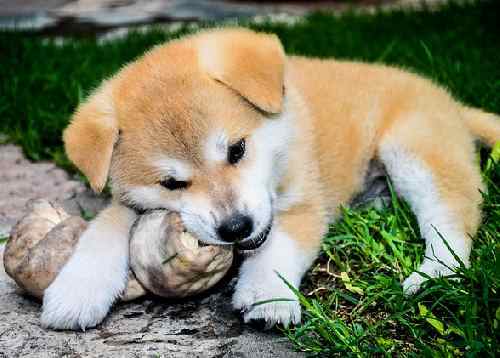 The Akita dog breed is not suited to apartment living as they need a yard or backyard to run in to ease their feelings towards confined spaces. Food aggression is a common problem, and so children must be taught to never, ever approach an Akita whilst it is eating or chewing a bone. They should be the only pet in a household too as they do not play well with others! 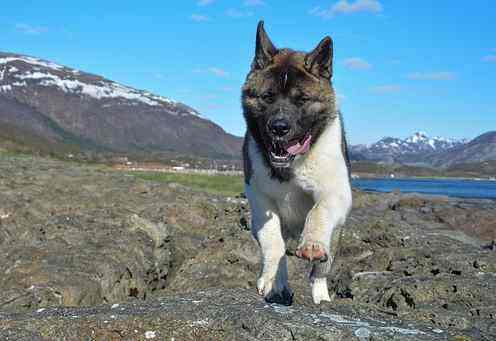 The Akita dog breed is on the banned list of many insurance companies so check beforehand that you can obtain the proper insurance before buying one. Or maybe you'd be better off with one of these? These Japanese fighting dogs are the largest of the Spitz group and were originally bred to fight and hunt bears and to guard Japanese royalty. They are solid muscular dogs with webbed feet which make them extremely strong swimmers along with a strong and imposing stature. 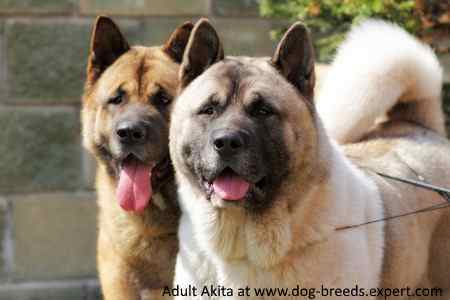 In all countries across the world except the US, Canada and Australia there are considered to be two different strains of Akita – The American Akita (simply referred to as “Akita”) and the Japanese Akita (referred to as “Akita Inu”). 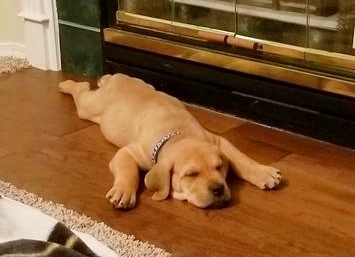 In America, Canada and Australia they are considered different variations of the same breed. As mentioned above they were bred to track large wild game such as Elk, Antelope and Bears and to hold them until the huntsman arrived to kill the game. Their predecessor, the Matagi-inu, was the dog of choice for this until 1783 during which a terrible famine plagued the area and over 7000 lost their lives. Food was so scarce that people began revolting and food was at a premium. Top priority for people then was to acquire a guard dog to protect them and whatever food they had in their possession. With this in mind, the dogs were bred to become larger and more substantial until they became the dogs we recognise today. Around 1897, dog fighting was popular in Japan and the Akita Inu (or Odate Breed as it was known then) was the strongest breed for fighting initially. Gradually, other breeds of fighting dogs were crossed with dogs such as the medium sized Japanese breed Shikoku Mastiff, German Pointers, St Bernard's and Great Danes; amongst others and proved to be the strongest dog. To counter this, the Akita dog breed were then crossed with a Mastiff and another cross-breed dog which is thought to be part St Bernard and then they became the superior breed. As with all Japanese breeds, their export was prohibited until the 20th century. 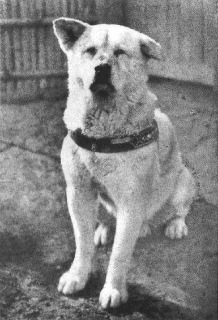 The first Akita Inu's arrived in England in 1937, the same year as the first one arrived in America with a Ms Helen Keller. A black mask is forbidden in Japanese Show Dogs. Akita Inu need a strong hand when it comes to training. You must establish yourself as the Alpha pack leader right from the get-go otherwise the Akita will walk all over you. Strength, confidence and consistency are the order of the day! They are dominant and strong-willed and are a real challenge to train. Akita dogs have a tendency towards aggression to other dogs so off the leash running in a local park is not recommended. It would be much safer to allow them a large garden to run around in. They are large dogs but a few brisk walks per day coupled with runs a few times a week should be enough. You might want to consider buying them a harness like the one above to give you more control. Socialising from an early age is a must as the Akita dog breed is prone to becoming aggressive and overly wary of strangers if not trained properly. Akita Inu make excellent guard dogs. They are used by the police and military in Japan for security. They give no warning before an attack and can be friendly one minute then turn aggressive in the blink of an eye. As mentioned in the Personality section, food aggression is very common with this breed of dog. Akita Inu have a durable double coat consisting of a soft undercoat and a rougher, harsh top coat. They shed heavily twice a year so expect to find hair everywhere in your home. Their outer coat is waterproof but this is removed when bathed so only bath your dog when absolutely necessary. Akita Inu dogs will also need to have their nails clipped and their teeth brushed. 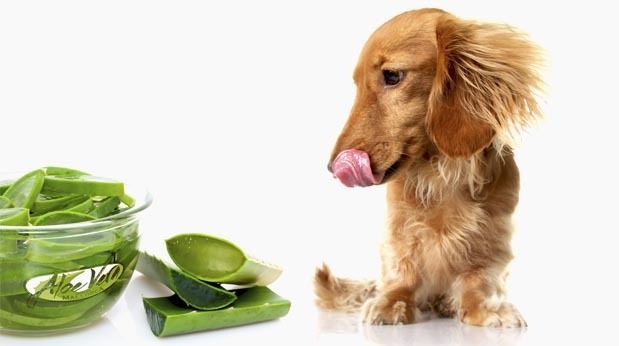 The aloe vera natural products can also help with many of the other conditions mentioned above. I found this really cute video of an Akita dog growing up from about 12 weeks old (so sweet!) into a gorgeous majestic 1.5 year old beauty. Hachikō (Haichi for short)– an extremely faithful Akita Inu who was so loyal to his owner that he waited every day at the local train station for his owner to return...even up to 9 yrs after his owner had died. He's so famous that he even had a film made about him! You could find out about other Dog Breeds in the A To Z List with photos or perhaps you'd like to check out more Dog Fighting Breeds?